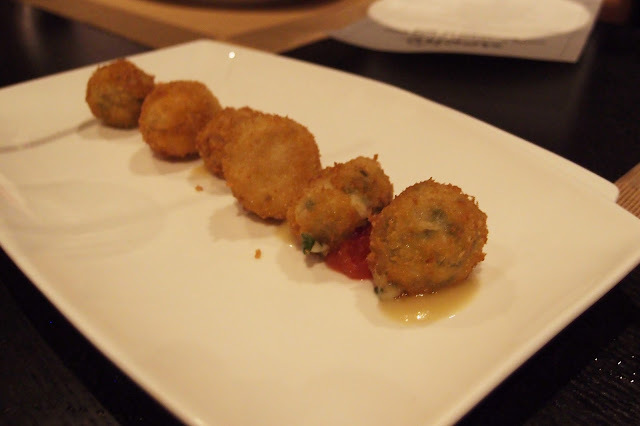 The FoodBloggersQTR have gathered for the second time in a remarkable night of good food and great company at Aceite, Melia Doha. All thanks to Doaa of Hungry Birds Doha who never gets tired of making things like this happen. 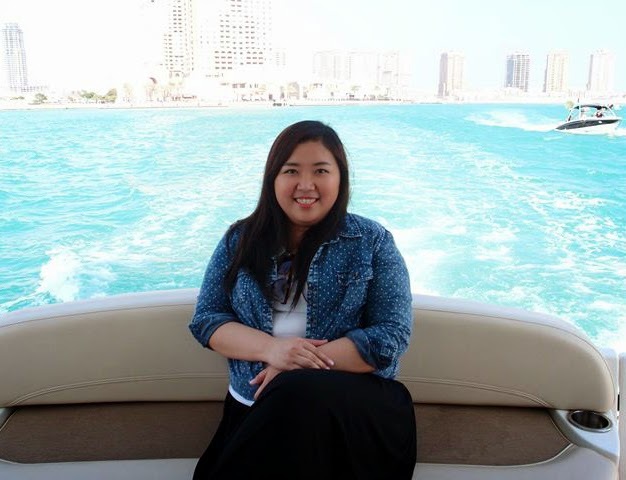 Did I mention that she's the one who initiated Food Bloggers QTR? I can still recall the first meet I’ve been to at Aramede, Crowne Plaza where I met some of Doha-based bloggers I follow. It was my first time at the Melia and boy was I surprised by the interiors of the lobby. It was very modern and sleek. Even Aceite’s interiors did not disappoint. We were first gathered at the bar area where I recognized some familiar faces and some new ones. There was a huge spread of tapas to enjoy while we were mingling and introducing ourselves to each other. Sangrias were also served. A live duo was playing Spanish music to keep the mood up. 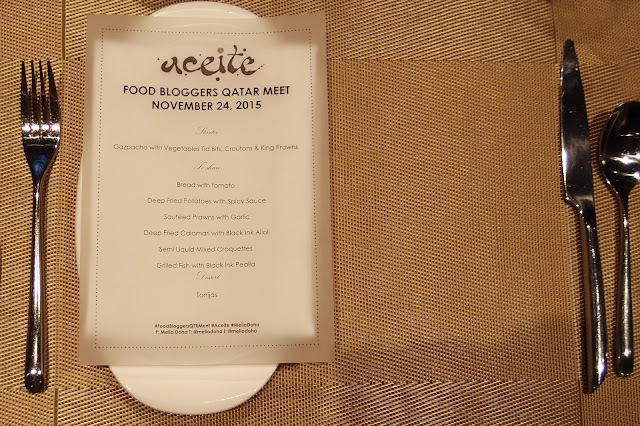 We were then gathered at the very long table – to prove that the food blogging industry in Doha is growing immensely. We were formally welcomed by Doaa and introduced to us some key persons behind the event. Hala of Ms. Hala.co and Community Engagement Lead of Zomato, who I think everybody knows because of the Zomato Meet-ups she so graciously throws. Kevin introduced the new Messo App, which I won’t be able to try since the Andriod app will be available early next year – but Apple users can now download it and give it a try. Nicolas Cedro, F&B Executive Assistant Manager of Melia, and Aceite's chef rounded up the speakers for the evening and introduced us to Melia and Aceite which serves traditional Spanish cuisine with contemporary touches. We were shuffled around the table twice to ensure that we got around and met with everyone. Although, I myself, did not get that chance, because as I've mentioned earlier, it was a very long table. Nevertheless it was fun and very engaging to have met these wonderful people behind the blogs that I read and follow. It was a very successful evening and I would like to congratulate Doaa and Zomato for a job well done. 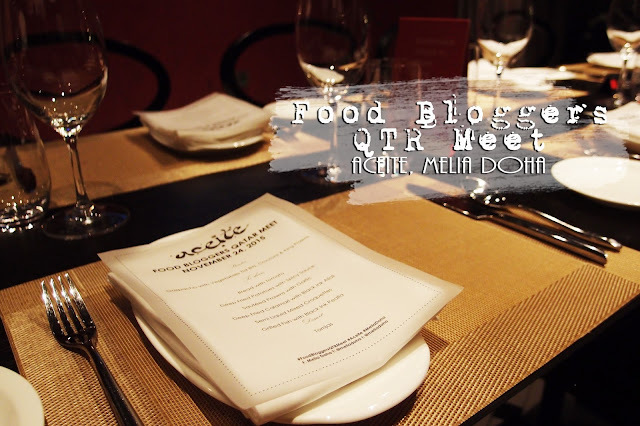 Here's to more Food Bloggers QTR Meets!!! The food looks soooo delicious!